This was a common thought among early Snapchat users. 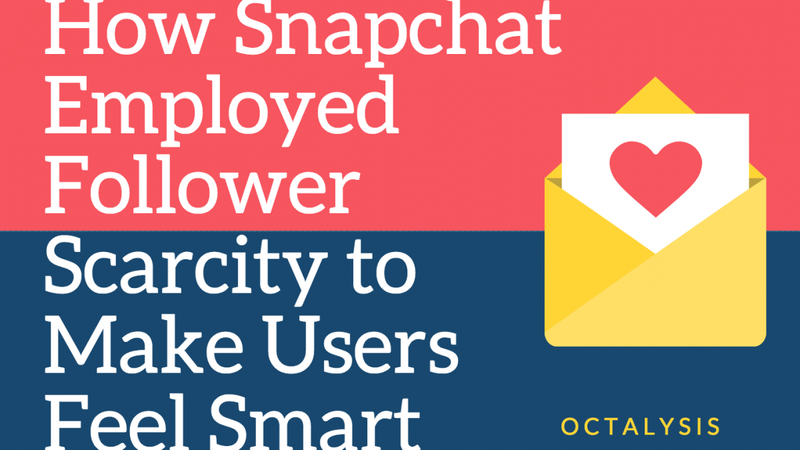 Snapchat’s decision to make users work hard for followers plays on the scarcity and impatience elements #2 and #3. What’s more, after they got those followers, those users experience Recruiter Burden (Core Drive 5: Social Influence & Relatedness) and feel the need to care please these followers. Here is of course where unpredictability and curiosity come in, the bread and butter and X-factor of any successful content creator. But Core Drive 7: Unpredictability & Curiosity is not the focus of this article. 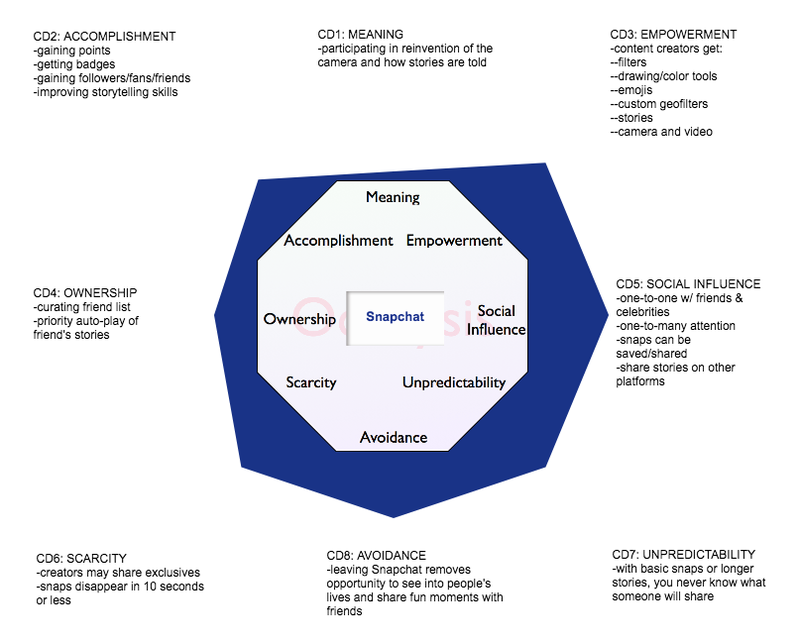 Before diving deeper into Core Drive 6: Scarcity & Impatience in the context of Snapchat, let’s examine Snapchat from a broader Octalysis lens. As a whole, Snapchat benefits from a balance of both intrinsic and extrinsic as well as right brain and left brain Core Drives. Although I created a complete Octalysis Graph (build your own at yukaichou.com/octalysis-tool/), let’s return to Scarcity. We’ve already discussed how hard it is to get followers on Snapchat. In the early days, people had to build followings through word of mouth. Users commonly shared their username on other platforms, and even used their Snapcode as their Facebook or YouTube profile picture. User gains a few new followers, feels smart (Core Drive 2: Development & Accomplishment), and repeats the Core Activity! 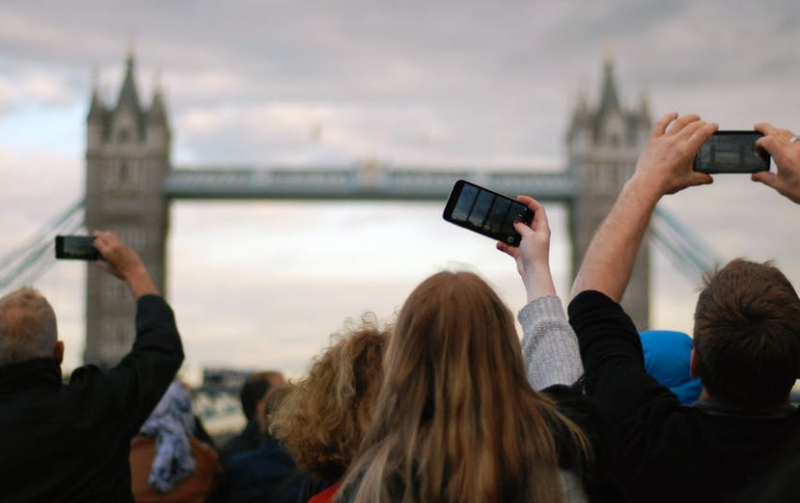 The reward of genuine interaction and connection (especially considering the ephemeral image- and video-based medium) drove engagement between creators and fans. This Booster of Core Drive 5: Social Influence & Relatedness also contributed to additional Core Activity Loops for creators. People continued looking for ways to Hitchhike Snapchat exchanges or stories into their daily routines. Like Snapchat, your product may already have some Scarcity built in, but if it doesn’t, you are probably missing an opportunity. But rather than testing your hypotheses without a properly defined strategy, you should base your design decisions on firm motivational design foundations. Use the power of a framework that works, on the human mind: Octalysis. Need help with deciding on how to do this? Talk to us today, we are here to help you out. Joris Beerda is the Co-Founder and Managing Director of The Octalysis Group. As a world-leading expert in Human-Focused Design and Octalysis Gamification, Joris’ global career in creating engagement spans across 17 years, 15 countries and 7 languages. He has designed Human-Focused experiences for dozens of Fortune 500s as well as medium sized companies. Joris is also a well known Keynote Speaker on Gamification in many renowned conferences throughout Europe, Asia, and Australia.